Make-A-Wish presented this certificate of appreciation to District Council 58 for making a wish come true for a child in need. On April 1, 2017, District Council 58 donated a $6,000 check to the Make-A-Wish Foundation of Illinois. DC 58’s generous donation was a gift for a three-year-old girl named Lillian who was diagnosed with a life-threatening respiratory condition. Lillian’s wish was for a backyard playset. Thanks to DC 58’s donation, the Make-A-Wish Foundation was able to make Lillian’s wish a reality. 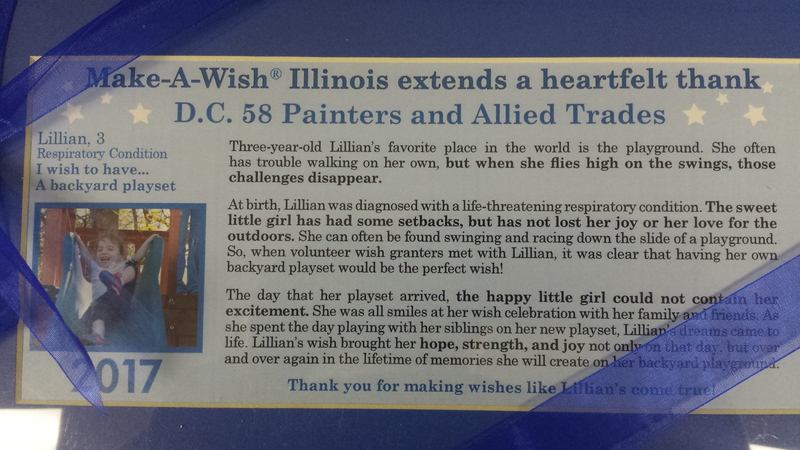 As a show of appreciation, Make-A-Wish presented DC 58 with a plaque commemorating the day Lillian received her playset. The International Union of Painters and Allied Trades thanks District Council 58 for making Lillian’s wish come true. Photo Caption (DC 058b.JPG): District Council 58 presents a $6,000 check to the Make-A-Wish Foundation of Illinois.